Abraham Junaid releases new single - 'Gba Gbogbo Ogo' featuring foremost Nigerian Rock band, Gospel Force. Abraham uses lyrical prowess to express a reckless abandon in worship of the Most High; the one who deserves all the glory. He enjoins the effort of Gospel Force to amplify his message. The use of symbolism creates imageries that depicts the mind of the writers and their eagerness to worship. 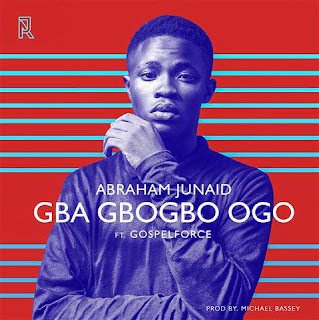 Abraham Junaid is a music minister, songwriter, singer and a recording artist, born and raised in Lagos, Nigeria. He strongly believes there is a message of grace and truth for this generation and uses his music as a platform to communicate this message. His greatest influences are City Harmonics, Hillsong, Bethel Music, Jesus Culture, Travis Greene. He has a collective of written songs and has recorded some. He currently serves in Rhythms and Rhapsody, the music arm of Petra Christian Centre, Lekki, Lagos.